My desire to travel the world, in recent years, has become irresistible. It’s a deep longing in my soul, a stirring I get every now and then, that makes me wish I could grow wings and soar above lands of antiquity and breathtaking beauty. It’s an itch to see a new world and be immersed in new surroundings, filled with people I’ve never met and cultures I’d love to explore. It’a a desire that keeps me up at night, as my mind can’t help but imagine all the wondrous sights this wonderful world is filled with. Unfortunately, travel is expensive! And so I’ve never actually been anywhere, unless you count Pakistan, to visit family (which I don’t). I’ve been to Florida twice, New York and Montreal once. I haven’t travelled my own country yet, but that doesn’t stop me from dying to see the rest of the world! 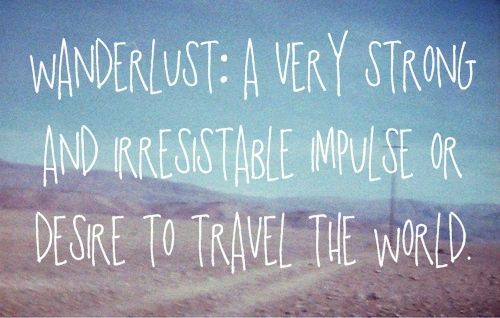 Pinterest has definitely awakened the wanderlust inside of me, especially over the past year or so. I keep seeing the same gorgeous photos splashed across its pages, which inspired me to create my own Places to Dream About board, to keep track of all the places I dream of visiting. The list grows every day! So here is my list of places that are literally calling to my soul. Ah, Italy, where to begin? So when I used to think of Italy, I used to only think of Venice and Rome. Venice seems to be a hauntingly beautiful city, with its wondrous waterways that wander through the city. And Rome with its ancient ruins and history, has always called to me. But recently I’ve discovered many more gorgeous cities and towns in Italy, like Sorrento, Positano, Cinque Terre, Lake Como, and not to mention the Amalfi coast. I would love to walk the cobbled streets, under ancient archways, along the same steps as great artists and architects. But France is more than Paris! It’s also got many smaller villages and towns that seem like they’re plucked right out of a fairy tale. I can just hear Belle singing “Little Town” from Beauty and the Beast in the background as I type this! The world may have become more technologically advanced and filled with population, but these little towns seem like they’re frozen in a much simpler, easier time. And you can’t forget about Versailles, the center of French opulence and decadence. It’s a palace teeming with history! The French Riviera or Cote d’Azur includes the south of France, but it also includes the principality of Monaco. It’s on the Mediterranean coastline, which makes it share the stunning blue Mediterranean sea and climate. I have an obsession with water; any city or town perched on the edge of a cliff, near water, simply calls to me. And when I see these pictures of Monaco always being of quaint houses perched on hills, staring into crystal blue sea, my heart just flutters. Everything seems so colourful and so clean, and pristine. Remember what I said about water calling to me? The same goes for Greece! When I first saw the famous blue-capped, white houses of Santorini in a movie once, I fell in love. Perched on top of a hill, the houses are crowded but gaze out onto the stunning blue of the Mediterranean sea. I dream about travelling through all the small islands of Greece, walking along the jagged coastline, climbing the steps of cobbled stairways to blue-domed houses, and feasting on the succulent seafood found fresh in the sea. But no trip to Greece is complete without a trip to historic Athens! A centre for Western cultural birth, there is so much history buried beneath the surface here. Egypt has been on my travel bucket list since I was a little girl. I used to want to be an Egyptologist when I was younger, because I was enthralled by Egyptian history. I know there’s more to the country than ruins, especially now, but for me, it’s a place of childhood fascination and I cannot wait until the day my eyes feast on the breathtaking beauty of the Pyramids! I’ve watched countless documentaries about them, seen thousands of pictures, but I’m sure they do no justice to their majestic presence in person. I’d love to breathe in the air at the Valley of the Kings, where hundreds of pharaohs were buried with all their worldly belongings, take a cruise down the Nile, one of the most fertile rivers in the world, and travel to Alexandria, one of the metropolitan cities of the ancient world. Ah, Egypt! These are just a few of the places I’m dying to visit! If I kept going, this post would never stop! Other must-see places include: The United Kingdom (also a childhood dream- Harry Potter, Jane Austen, Shakespeare; need I say more? ), the Maldives, Turkey (a crossroads of cultures and continents, plus so much history), Austria, Switzerland, and Malaysia. So many places, not enough time! Even as I’ve been writing this post and selecting pictures to share with you all, I’m getting the itch again. Pictures are one thing, but I want to experience the world with smell and sound, touch and taste, and not just through the screen. What are your top places to visit? This entry was posted in General News and tagged me, travel.